Jujuman; Driving, powerful, house music with a purpose, dark, reverb vocals and an unrelenting energy make this a release not to be missed. 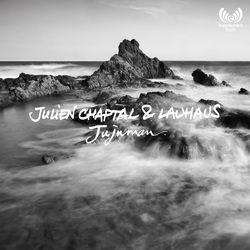 Julien Chaptal; an absolute master of his craft brings the heat, this is a bona fide dancefloor destroyer, layered complex rhythm patterns and a huge bass line make this for me the standout track of the EP. Jujuman (Franck Roger remix); The Franck Roger remix only builds on the original with some serious hi-hat and synth work, this is an intense builder with a much techier/acid house feel (think Baby Ford) serious head down stuff for the heads. Watching You; An adventure into dub undertones and kick drum heaven, a serious groove with perfectly suited druggy vocals, love, love, LOVE! Definitely an EP for the darker side of house, driving, relentless and in your face, watch out!